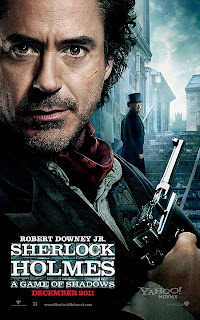 In SHERLOCK HOLMES: A GAME OF SHADOWS, the flash-bang deductive kineticism of Sherlock Holmes’ intellectual prowess is once again overshadowed by the blam-kaboom of Guy Ritchie’s hyperactive explode-now, think-later actioneering. If anything, there’s even less sleuthing here than in the original, as Robert Downey Jr. lurches and slouches from action set-piece to action set-piece, slowing down only long enough to once again presage a fistfight, blow-by-blow, or narrate an expositional flashback to off-screen detective work that he supposedly performed in the cuts between gunsmoke and flames. Granted, the dedicated momentum means it feels marginally shorter than its two hours and change, and the action itself isn’t without carnivalesque flare (on these merits alone it beats the pantaloons off every PIRATES OF THE CARIBBEAN sequel) – still, it’s just , well, sorta dumb. Making good on the first film’s menacing introduction of Professor Moriarty (Jared Harris), GAME OF SHADOWS plays out as a Euro-hopping game of coyote and road runner, trading the occult murders and inspired steampunk gadgetry of its predecessor for corporate jockeying, terrorist intrigue and ho-hum steampunk mayhem. As Holmes and the newly wed Watson (Jude Law) pursue the sinister and mysterious Moriarty across International borders, we’re introduced to Sherlock’s sibling, Mycroft Holmes (Stephen Fry), feisty gypsy Sim (Noomi Rapace) and disgraced soldier and right-hand to the Prof, Colonel Sebastian Moran (Paul Anderson). In less capable hands, these pulp archetypes could feel as worn and tiresome as Ritchie’s slow motion gunplay, but the cast steps up, assisted by the out-sized plot, to make otherwise cringingly eccentric characters feel right at home. Harris, in particular, does an impressive job at playing Moriarty, whose early conversations with Holmes help sell the pair as history-tested, fate-approved nemeses. My issue isn’t necessarily that Ritchie and husband-and-wife screenwriting duo Michele and Kieran Mulroney get Holmes “wrong”; I’m not saying I love Downey’s handsomely disheveled mania, but, like any of the dozens of interpretations of Sherlock throughout the last century, it captures as many of his Doyle-given traits as it ignores (or Jack Sparrowizes). And anyway, like Ebenezer Scrooge and/or Batman, Holmes has been immortalized so many times, from Basil Rathbone to Jeremy Britt to the Great Mouse Detective, his identity is less a single fixed cultural value than a multitude of points on a line, with trends and outliers, from which we - the children and dreamers and fanboys - subconsciously calculate an average: the gaunt, pipe-smoking, violin-playing, coked-out Brit, out of whom we craft new variations. My problem – and it’s not new to these films, but certainly highlighted in them – is the way they subvert the notion of the Holmesian mystery as a game. “The game is afoot,” our average value (and Downey Jr.) Sherlock is often heard to proclaim, and in the best of Doyle’s stories, it was a game – a game in which we could participate, or at least test drive the gumshoe's loafers. The Rules of Fair Play, as they apply to detective literature, afford that a reader has the same information as the detective, and, as such, can solve the case with, or even before, the savvy protagonist. Obviously, this formula is more difficult to execute in film and television – viewers can’t linger over the description of a clue and are, theoretically, bound by the prescribed pace and time constraints of the movie/episode. But A GAME OF SHADOWS doesn’t event invite us to play. There are the aforementioned flashbacks, constant, unforeseeable turnabout, and left-field revelations to spare.